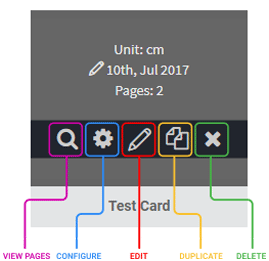 The Designs section in PitchPrint admin is where you get to create, edit, configure or delete designs assigned to a domain. Designs here are sorted based on categories, like a single-level folder system. So every design belongs to a parent category. Shown above is a design category titled Blue Business Cards with 4 designs. To create a Category, simply click the Create New Category button on the top right corner of the page and provide a category title for it. The menu list is self explanatory. The Bulk Configuration Panel is a means of applying a configuration settings across board to all the designs in that category. Some settings are excluded like the title since those are unique to each design. Clicking it shows the configuration panel which is a limited version of that shown per design. Please refer to the section titled Configuring each Design below for an explanation of each setting on that panel. 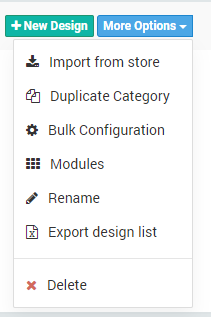 Kindly remember, whatever action you take using the Bulk Configuration panel will be applied across to all designs included in that directory as against each design. Design Title: This is the design's label. Welcome Message: Here, you can write a custom message or instructions which will be shown once the application is launched and the design is shown. Hide Tabs: Use this option to toggle visibility of each of the 3 tabs: Background, Pictures and Text tabs. By default, they are all off, which means they will all be shown. If for example you don't want customers to change this design's background, then you can turn ON the first switch and when the application loads, the background tab will be hidden. Disable Image Click: If this switch is ON, customers cannot click images on the left Pictures panel to them to canvas. They will only be able to drag and drop their pictures. You may need this feature if you have a canvas design with mask spots where you only want users to drag pictures into specific mask containers as against clicking which will just place it on the canvas. 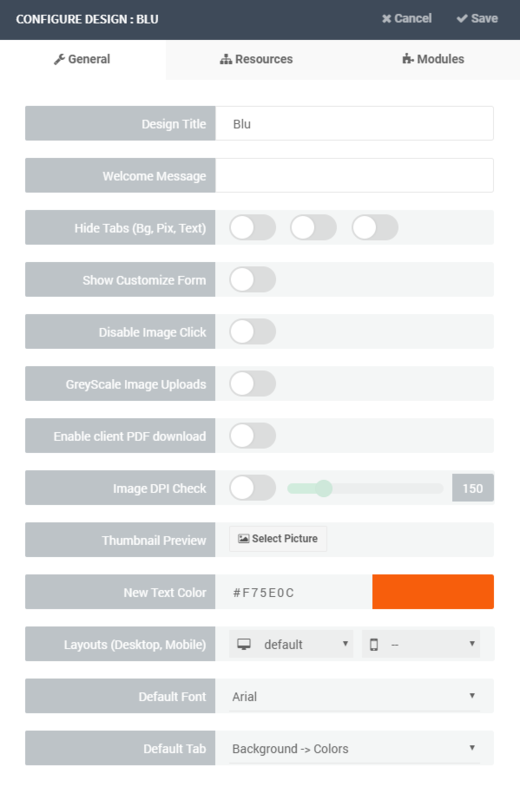 GrayScaleImage Uploads: This is a premium feature that will convert any user uploaded images into greyscale while in this design. This is not a site wide feature. You may need this feature if your product can only be printed in black / white and non-color. Enable Client PDF Download: Enabling this option will allow your customers to download the PDF after creating their designs. Thumbnail Preview: By default, the app uses the design page snapshots as previews where the design is required to be displayed, like in the design selector module. If however you set a thumbnail here, this will be used instead of the design snapshots. This can be used to show perhaps how perhaps the design looks on a product. Default Font: This is the default font for this design. So when a new text is added to the canvas, it uses the font you have set here. Default Tab: Here you set the default tab that should be shown when the design loads. For instance, If it's a photo album design, you may want them to see Photos -> Upload so customers get right straight to work uploading their photos. The resources tab allows you to sieve or filter what resource gets loaded per design. This is for Pictures, Backgrounds, Colors, Fonts and Text Art styles. There are two modes to choose from Exclude or Include. If you select Exclude and nothing was selected in the input box, this means every category in that resource will be loaded when that design loads. If still you have Exclude but selected certain categories of resource, then everything will be loaded EXCEPT those you have selected. The reverse is for include.